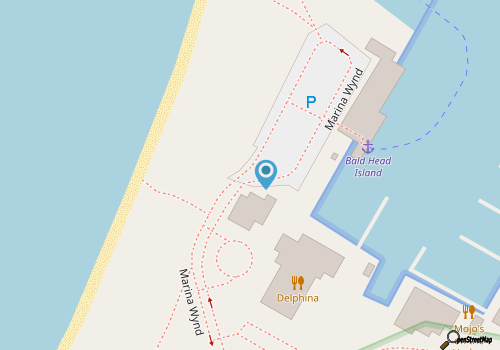 Delphina Cantina is a cool little spot for visitors who have freshly arrived on Bald Head Island and are in the mood for a light bite or an ice cold drink before making their way to their vacation rental home. Offering an expansive menu that features fresh Mexican fare, (as well as pizzas which can be delivered to veritably anywhere on Bald Head), patrons can enjoy a chic coastal atmosphere and a world of flavors without ever leaving the island. The menu is divided into a number of categories, including appetizers, salads, burritos and bowls, tacos, quesadillas, tortas (or sandwiches) and entrees, and every category seemingly has its own blend of unique Mexican and southern-infused cuisine. The entrees section boasts some of the most eye-catching dishes, like the Madrid style shrimp and grits with chorizo and garlic saffron, or the seafood enchiladas with shrimp, scallops and crab, but even more traditional Mexican tastes can be accommodated, with classics like Carne Asada tacos and chicken quesadillas with guacamole and crème fresh. The interior is warm and welcoming, and is perfect for relaxing with an ice cold margarita. With lots of crisp flavors and colorful fare to choose from, Delphina Cantina is an all-around refreshing spot to start or end a vacation in acclaimed Bald Head Island.